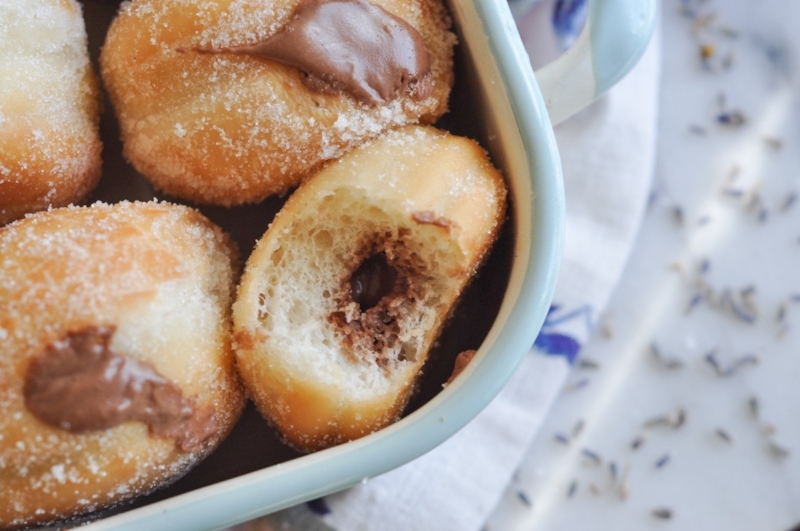 I hope all is well for you in the snooze department, but if it's not you might enjoy spending an early morning making these sourdough donuts with lavender ganache filling. I tested this recipe 3 times before I felt comfortable posting it, and let me tell you... it's one of the top three things I've ever made. The sourdough starter gives the dough a springy puffy texture, that isn't overpowering in the slightest. I covered the finished donuts in vanilla sugar, that I made by sticking an old vanilla bean into some a small batch of granulated sugar. I let it sit for a 1-2 weeks before using it, but if you don't have any of that on hand you can just use regular sugar. The filling is on another level though, with lavender infused right into the dark chocolate. It's so delicate and elegant. I couldn't believe how good it tasted and I'm going to potentially frost a cake with it at some point. These little cuties are the perfect thing to make for a Sunday brunch or anytime during spring. If you want to make these but you don't have access to sourdough starter, I've got a recipe for yeast donuts that you can use instead. But make sure to come back here for the filling! The night before you want to serve your donuts, prepare the sweet dough by combining the plant based milk, and melted vegan butter, set aside. In a mixing bowl, combine the sourdough starter, aquafaba and sugar. Slowly add in the milk mixture and then the sugar, salt and all purpose flour. After mixing you will have a shaggy, rough dough. Cover the bowl with a damp cloth and set aside to rest for about 30 minutes. After you've allowed the dough time to rest, knead it with your hands or a dough hook until a thick dough is formed. The dough should be workable, not too stiff, and easily stretchable. This will take about 6-7 minutes. Cover and set aside to rest for another 30 minutes. After the second rest, slowly work the dough into a ball by pulling from the outside and tucking it into the center. Do this all the way around, then cover and allow to rise in warm, dry place overnight and double in size. About 8 hours. The next morning, roll the dough out into a rectangle on a oiled and floured surface. I like to use a silpat or pastry slab, but your counter will work as well. Let the dough rest for about 10 minutes while you prepare a baking sheet by lining it with parchment paper. Then, cut out 8 squares the size of the donuts you'll be making to ease the frying process later (trust me on this one). After the dough has rested, stamp our circles of the dough and place each one on its individual square. I like to use a drinking glass for this, because it's the perfect size and and I don't own a cutter that will work. After you've stamped out 8 donuts and placed them on their squares of parchment paper, cover them with a tea towel and allow them to rise in a warm place for about 60-90 minutes. If it's cold where you are, sometimes it's helpful to rise them in a turned off oven with the light turned on. After the rise, it's time to get frying. Use a dutch oven or other large pot and fill with enough vegetable oil for the donuts to fry in. Use a candy thermometer to heat the oil to 350 degrees Fahrenheit, before frying each donut one at a time. Use the individually pieces of parchment to gently slide a donut into the oil, being mindful that the oil is VERY hot. Fry for 2 minutes on each side, and notice that the donut will be golden brown and not too crispy. Set aside on a baking sheet lined with paper towels to soak up leftover oil. After you've fried all your donuts, let them cool before rolling them in the vanilla sugar. Then, using a sharp knife or the appropriate nozzle from Wilton, puncture a small hole in the side of each donut. To create the filling, place the chopped chocolate in a large bowl and set aside. Heat the better half and lavender in a small saucepan until just boiling, stirring gently to avoid burning. Then, strain the lavender out by using a metal sieve. Pour the infused better half over the chopped chocolate and set aside. After 10 minutes the chocolate will be melted and you can stir the mixture into a thick but pourable ganache. Add the vanilla in here, and then the powdered sugar to thicken up the consistency slightly. Once the ganache is cool, pipe it into the holes in the donuts. This part is a little messy, but looks so gorgeous afterwards. Roll the donuts in extra sugar if needed and serve immediately. Donuts can be stored for three days in a box that isn't completely airtight to keep their texture. ** I've only ever used the Califia Farms Better Half in this recipe, but I think a very thick coconut milk will work too. I am not sponsored by Califia Farms, I just really dig their products. If you don't have sourdough starter you can still make these donuts using my yeast recipe! Recipe adapted from my Sourdough Breakfast Rolls.